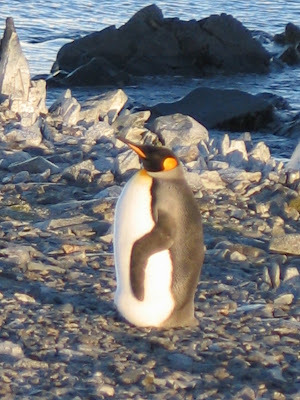 The other night, an announcement went out that a rare King penguin had been sighted on Torgensen Island, just across Arthur Harbor. I had been up on the glacier videoing Mount William, but at dinner, Jeff invited me to take a boat out just before our 10PM boating limit. The King was just standing alone and he has been there for a couple of days now. No one here knows where he came from or where he is going. 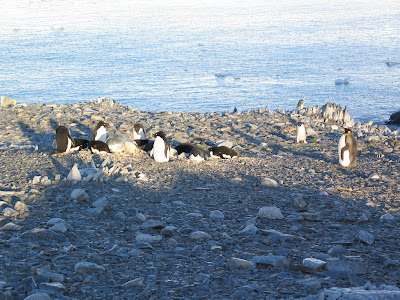 Obviously the colony of Adelie penguins on the island don't seem to mind. Indeed, they don't mind humans either. Tha's the Adelies and the King, above. 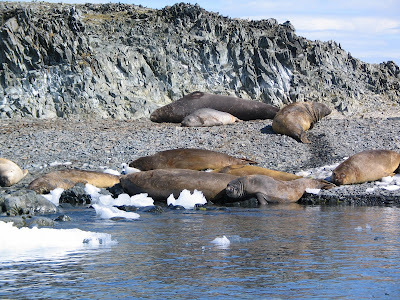 Just 100 meters from Torgensen is Elephant Rocks, clearly Elephant seal territory. It's rare to see a penguin there but the elephants are all over the place. Cozy, too. 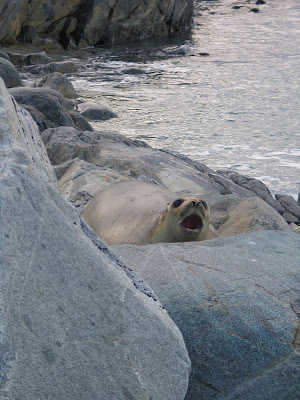 This elephant seal, probably an adolescent climbed up on the rocks no more than 5 meters from the station, on the rocks that I use to fish out ice pieces. I started to go down the snow-grid path to the dock and this guy made threatening noises. From my experience with the elephant seals in Northern California, I didn't take him too seriously, but I still used a telephoto lens. 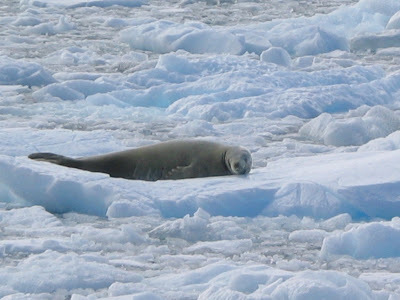 We think this is a leopard seal, because of his prominent head, even if we didn't see any spots. 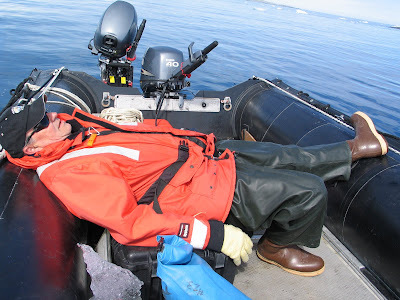 He was on a berg that was floating by quickly in the current and raised his head every so often presumably to see how he was being carried along. 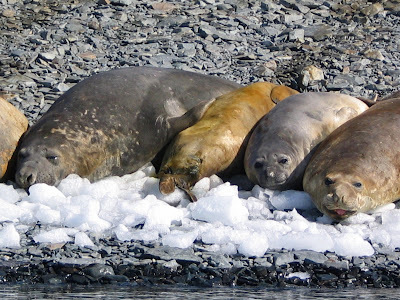 This is the famous quinnar seal of Palmer Station in a semi-relaxed moment. Palmer has been hard work for Mr. Quinn and he takes his rest when he can. 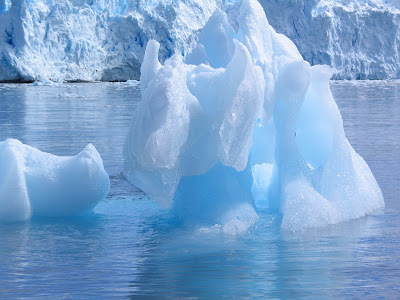 No post of mine would be complete without a few pictures of ice. 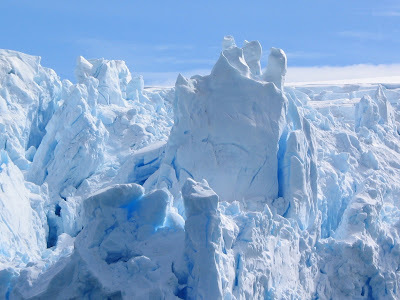 this glacier face is so fantastic, I could never get enough of seeing it. The berg probably calved from the face right there. The form is right, anyway. 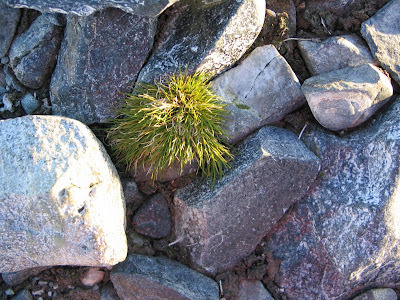 Here is an actual plant; let's call it a charismatic macroflora in honor of Matt who works on plankton, here. I think this is the only plant with leaves, if you can call blades of grass, leaves. The only other greens plants I have seen are a couple of mosses. I suppose lichens are plants, too, but they don't count in the green category. I LOVE the picture of Mr. Quinn sleeping! Great photos, as usual. You are going to have to rent "Happy Feet" when you come back. Your penguin photos and stories sound just like the movie. Enough pop culture: I am amazed that something green actually grows at the bottom of the world. that bottom one of the berg is great, speaking of macro-fauna, doesn't it remind you of a bison? Boy am I going to miss your posts!